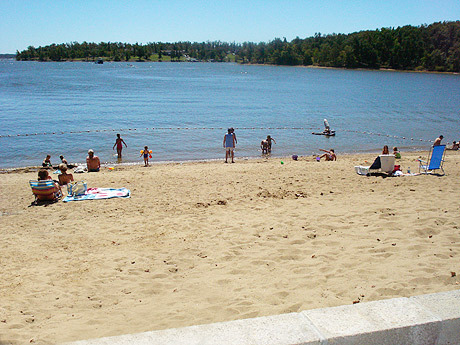 The term "lakeshore" here refers to the East shore of Barkley Lake and the West shore of Kentucky Lake. 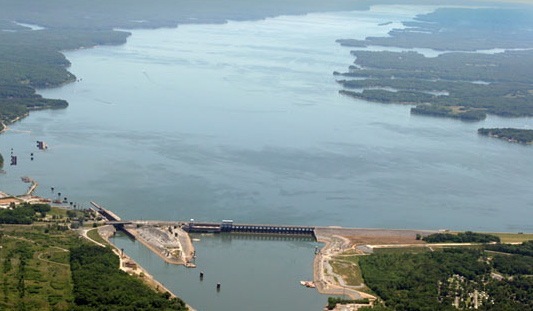 There can be no restaurants on the two inside shores, the West shore of Barkley or the East shore of Kentucky Lake, because that long penninsula is part of the federally administered Land Between The Lakes. No commercial development can occur there. 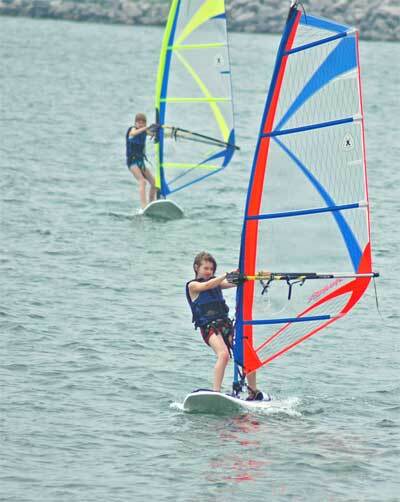 But since all the lodging and most of the beaches are around the outside edges, this is not a problem. Most of the people in the LBL are hiking, backpacking, bicycling, fishing, kayaking, horseback riding or windsurfing and aren't looking for restaurants. 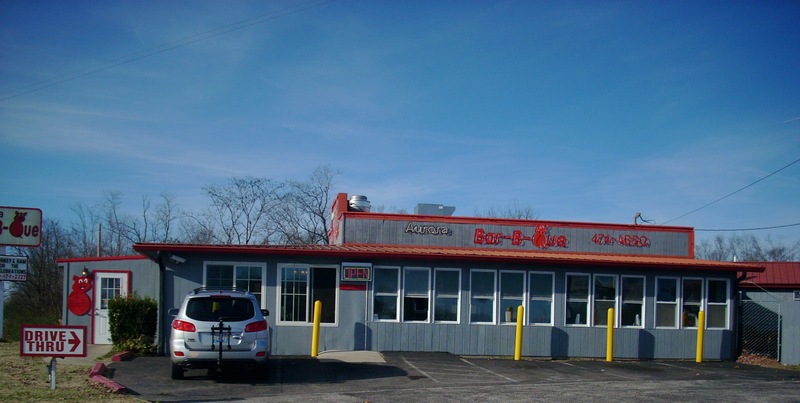 There are good restaurants all the way down to the Tennessee state line (and beyond), but most of them are clustered across the top (along the dams and the canal) and down the northern part of each lake, near the interstate and the state parks. Remember this is the largest tourist complex in the Midwest and especially during the Summer you need to make reservations or expect an hour wait. The restaurants we review here are the best so they are particularly crowded. One secret is to eat early, 5-6 p.m., as a way to avoid the rush. Most people come off the lake around that time and it takes them an hour or so to shower and change. If you're only going to eat out at one Kentucky Lake restaurant, it should probably be The Brass Lantern in Aurora. This 1972 establishment is a big place, with five rooms and a total capacity of 208, meaning it can handle groups or large families with ease. They take great pride in their charbroiled steaks. The Filet Mignon, New York Strip. Top Sirloin and Ribeye are their signature items and definitely worth ordering. However, they also do a good job with Seafood. We think their Scallops, Salmon, Mahi and Tilapia are their best, although the Shrimp, Oyster and Lobster are as good as they can be this far from saltwater. They do a good job with Pastas and Ribs. Try to save room for dessert, especially the Turtle Pie they're so proud of. Patti's 1880s Settlement has added features over the years until it's a whole tourist attraction in itself. 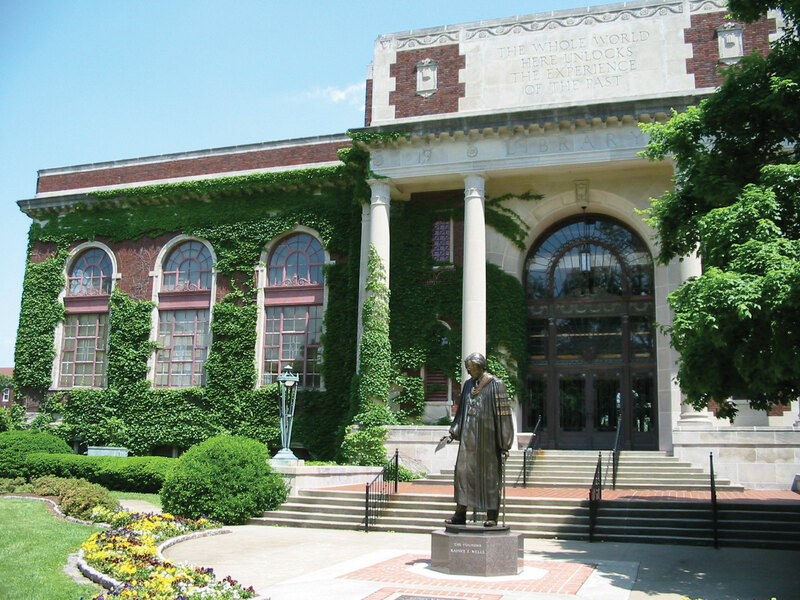 There's a miniature golf course, gardens to stroll, gift shops to browse, a petting zoo, marriage gazebo, etc. Make Reservations. Without them, you'll be guaranteed an hour or more wait. The menu is uneven. We advise skipping the steaks. The kitchen does a professional job of fixing them, but for some reason the cuts are inferior; Patti's needs to change suppliers. However, their signature item, the two inch pork chop, is famous over a four state area. It really does live up to the hype. You've never had a pork chop like it. There's a junior one inch version that is also very good. Their famous flower pot bread with homemade strawberry butter is delicious; you have to be careful not to fill up on it before the meal arrives. Their other signature items are their Kentucky Hot Brown, one of the finest versions in the state, and their pies, widely known for their six inch meringue. Chocolate Pecan Pie is particularly obscene. They do a great job with various chicken dishes. The Fried Chicken Salad is unique. They make a hot bacon dressing for salads which is quite unusual. Caution : this is in a dry county so there are no alcoholic beverages available. 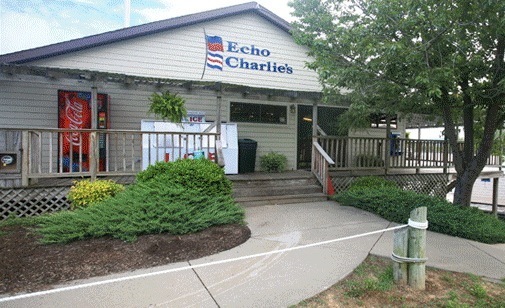 Echo Charlie's is located on the water in the Eddy Creek Marina at Eddyville. They don't have an extensive menu and we recommend you skip the first half, which features breakfast, burgers and fried items. However, when you get to the heart of the menu, there's some serious eating here. The Soup of the Day and French Onion Soup are worth ordering. There's New York Strip and Ribeye. They fry or grill up a fine Catfish and by request they can do it Cajun style. But it's the Chargrilled Pork Chops and Grilled Yellow Fin Tuna that you come for. If you've never tried Yellow Fin Tuna this is a fine time to do so. It's one of the great eating fishes in the world and too few Kentucky restaurants serve it. 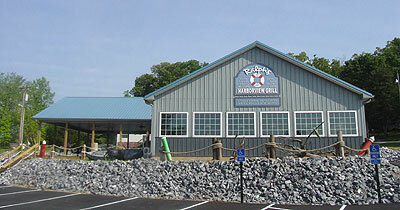 Ralph's Harborside Grille is the restaurant in Moors Resort at Gilbertsville, within sight of Kentucky Dam. If you're looking for breakfast, this is your place. You can start with their Turtle Shell Pancakes, a concoction of toasted coconuts and pecans in caramel sauce. They offer Reece's Pieces Pancakes, Chocolate Chip Pancakes and more conservative Blueberry Pancakes. They've got a full page of French Toast and Omelettes, including Jalapeno, Crawfish and Salsa Omelettes. For lunch you can try their Kentucky Lake Hot Brown, Crawfish Po Boy, or Catfish Sandwich. The dinner menu features Grilled Iclandic Cod and Catfish (ask for it grilled not fried), but what you come for is the Frog Leg Platter (one pound of grilled legs in melted butter). On weekend evenings there's a Salad Bar. During the week, the Spinnaker Salad (lettuce, tomatos, onions, peppers, cucumbers, eggs, cheese, bacon, carrots and your choice of meats) supplies your greens. The Grilled Shrimp are also pretty good. Windows on the Water is the 331 seat restaurant in the Lake Barkley Lodge. The glass design gives diners panoramic views of the water and the wood trim adds a touch of class. If you're not staying here at the lodge or cabins, allow time before or after your meal to explore the grounds, as this is a spectacularly beautiful state park. 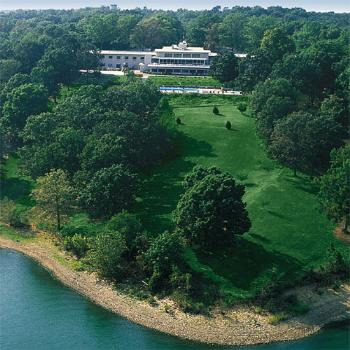 As in all the state park restaurants, this one has limited hours (4-8 dinner) and menus and offers buffets and salad bars for most meals, although you can also order off the menu. The food is traditional Kentucky cuisine. They use locally grown fruits, vegetables and meats for 80% of their food, which means the salads are usually fresh and very good. Chef Hattie Cheatham specializes in such downhome favorites as Meatloaf, Fried Chicken, Catfish and Hush puppies, and prepares one of the great Kentucky Hot Browns in a state where restaurants compete on this item. If you order Catfish, request it baked or grilled. Yes, we know, Fried is the classic Kentucky style, but our staff chef, Gustou Cuisine, says all fried food tastes alike : all you taste is the frying. If you've never tried Catfish baked or grilled, this would be a good place to start. It has an exquisite taste. The Ribs, Barbeque, Prime Rib and Macaroni & Cheese are also very, very good. The Mashed Potatoes and Gravy are real and prepared in house. For some reason, we have never thought they did an especially good job with their Soups, but their Desserts are usually outstanding. For breakfast you can get Bacon, Sausage, Scrambled Eggs, Hashbrowns, Grits, Biscuits & Gravy, Toast, Juice and Coffee for $10. Trigg County was recently voted Wet, but this being a state park, it's still Dry, so there's no alcohol served. 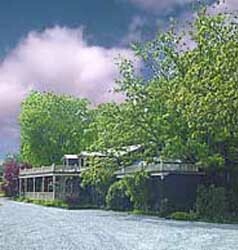 Aurora Landing is the restaurant in Kenlake State Park Lodge, over on the western shore of Kentucky Lake. 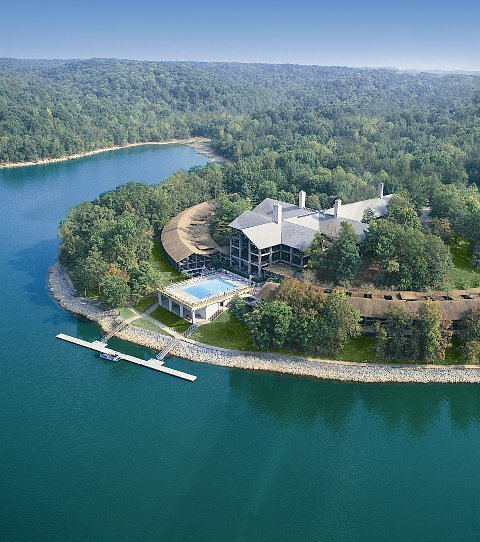 This lodge sits rather far back from the water, so although you can see the lake from certain angles, it does not dominate the view as it does at Lake Barkley. Instead, the view focuses mainly on a floral garden. The buffet and menu have the same basic state park page of Meatloaf, Fried Chicken, Hot Brown, Catfish, Prime Rib, Barbeque and Macaroni & Cheese. And they join the other parks in using 80% locally grown meats, vegetables and fruits. But in an attempt to establish their own identity, Aurora Landing has replaced Hush Puppies with Rolls & Butter sprinkled with herbs and added an Italian page. There are Polo Ala Calvi (breast of chicken and mushrooms in white wine sauce), Gambaroni Ala Calvi (shrimp, onions and bell peppers in white wine sauce), Pasta Alfredo, Linguini and several other Italian entrees. Calloway County is dry, so there's no alcohol. For breakfast you can have Fruit, Muffins, Omelets and another Aurora Landing specialty, the French Toast. Like all the state parks, the hours are limited. Dinner is from 4-8, Breakfast 7-10 and Lunch 11-3. Tucked off a side road (Old Route 80), at the intersection of Highways 402 and 68, two miles north of KenLake Lodge on the West Shore, is Aurora Barbeque. This is the old Aurora Passenger Station from when the Illinois Central stopped here. They do have good Barbeque. They also have good Fried Chicken, Mayonnaise based Cole Slaw, Garlic Breaded Mushrooms, Baked Beans, Green Beans and Potato Salad. You can even try a few exotic items like Barbequed Balognie and, for dessert, a Reese's Razzle. But none of those are why you come. You drive down the lake for their Black Angus Burger and Black Angus Cheeseburger. Black Angus is a great cut of beef, these folk know how to fix it, and they give you a thick pattie. These are unquestionably the best burgers in the Kentucky Lake region and among the best in the state. Lemonade, Root Beer and Sweet Tea are available, along with the usual beverages. 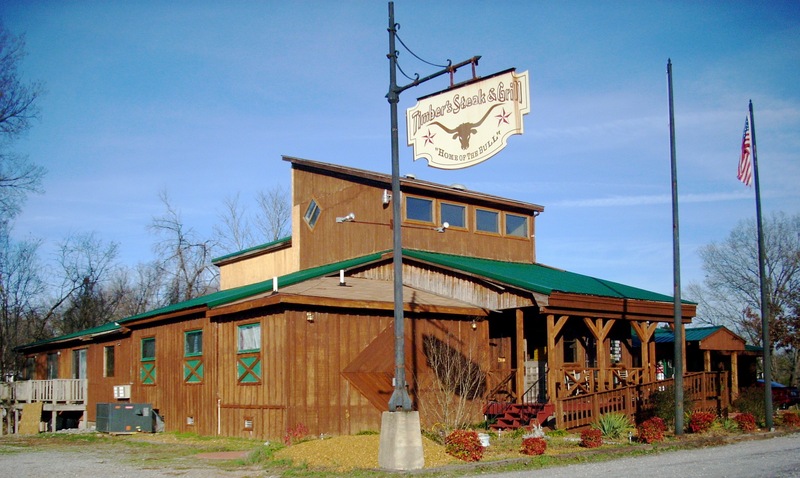 On the Eastern Shore, between the lake and Cadiz on Route 80, is Timber's, the region's best steak house. Don't let the rustic interior distract you : the food here is outstanding. Their claim to fame is their Smoked Prime Rib, but there are also crisp, fresh Salads with homemade Ranch and Blue Cheese Dressing. Our favorite is their Cranberry Pecan Spinach Salad, which includes red onions. Among the appetizers, we suggest their Pig Wings, smoked pork shanks deep fried, and Beer Battered Fried Pickles. They serve excellent Cole Slaw, and very good Smoked Pork. All the smoking is done out back. The Ribs, Grilled Chicken and Tilapia are outstanding. For couples the Sirloin for Two is worth considering, and the Bread is always good. Vegetables are locally raised, some if them on the grounds. Sides include Corn on the Cob, Garlic Smashed Potatoes, Maple Cinammon Apples, Baked Sweet Potato and White Beans. In all there are seven kinds of steaks. 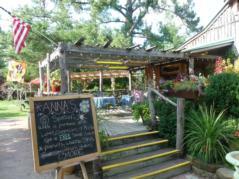 Even though we're a long way from the ocean, they do an excellent job with their Blue Crab Cakes and Grilled Salmon. Of course there's Catfish grilled or fried. Homemade desserts change daily. The Cadiz Family Restaurant is a longtime Cadiz tradition. 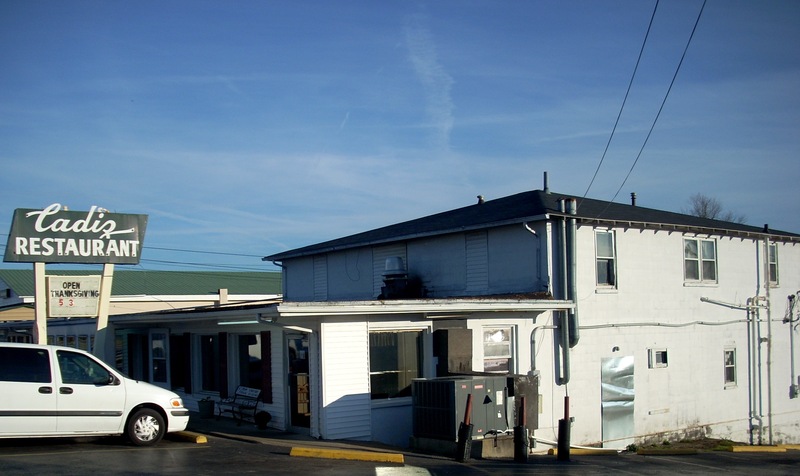 Located on the main street, just off Route 68/80, it offers smoke free dining and home cooked meals. There's nothing fancy or trendy here, just 20th Century style country food, with 20th Century prices. They're particularly famous for their breakfasts. You can get anything from Country Ham to French Toast to Ribeye Steak, accompanied by any kind of Eggs or Omelets you'd like. Later in the day, they offer five generous Salads, 19 sandwiches, four Chicken entrees, Ribeye, Country Fried Steak, and Grilled or Fried Catfish. The Homemade Pies are a local favorite. Many people stop in just for a cup of coffee and piece of whatever the pie of the day is. You're only 15 minutes from the water here, so it's a pretty convenient store.